Traveling to the Middle East? Going to Canton Fair 2013? China Southern start everyday Airbus A380 flights between Sydney and its home platform of Guangzhou today, Monday 28 October, creating this Sydney’s 4th superjumbo service together with Qantas, Emirates and Singapore Airlines. The A380 will obtain over the airline's CZ325/326 service, which departs Sydney at 11.15am to arrive Guangzhou at 5.30pm. The 502-seat superjumbo will increase the airline's capability by 40% as opposed to the Airbus A330 which presently flies this path. The inclusion of the A380 hats off a sequence of improvements to China Southern's other Australian destinations of Melbourne, Brisbane and Perth, all of which at present use the airline's newest Airbus A330s with lie-flat beds in business class and individual video screens in all economy seats. 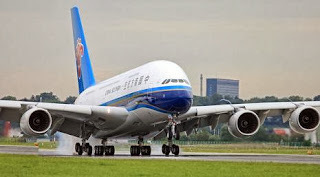 Passenger heading through to London on what China Southern calls its Canton Route - a Chinese spin on the Kangaroo Route - can create the second leg of their trip on a Boeing 787, with the choice of a 72 hour visa-free break in your journey at Guangzhou.